At Luriecq, in the Haut-Forez region, in just a matter of years, the Petit carpentry shop has succeeded in establishing a firm position in both the wood and mixed material carpentry sector thanks to its know-how and already consolidated reputation. At the beginning of this decade, the company made a number of investments, but the one that has really allowed it to increase productivity and widen its horizons is its digital command accord 25 fx work centre manufactured by SCM. Menuiserie Petit has been playing a leading role in the local wood industry for over thirty years. The company satisfies the requests of local institutions, companies and private customers by offering reliable, added value carpentry services. “Today, about 40% of our clientele is made up of private customers, while the rest consists mainly of building constructors and tenders,” explains Mauro Gramolelli, the current co-director of the Petit carpentry shop. In 2004 Mauro took the family company back over, together with his wife, and in 2011 they moved to workshops built in Luriecq. Located beside the provincial highway, the company sign hangs proudly on a wooden facade. “Our location has been a significant benefit as it has increased our visibility and allowed us to increase our turnover,” comments Mauro Gramolelli. Menuiserie Petit was previously run by Mauro’s wife’s father and specialised in installation with a carpenter specifically employed at the factory to create special pieces. In this period the company installed a huge number of windows in the Saint-Etienne area for both private and social landlords. Mauro Gramolelli himself worked with his father-in-law for fifteen years as an installer, and when the older man retired in 2010, Mauro took over the company and launched it in a new direction by intensifying manufacturing operations. “We began with classic machines for producing door and door frames. 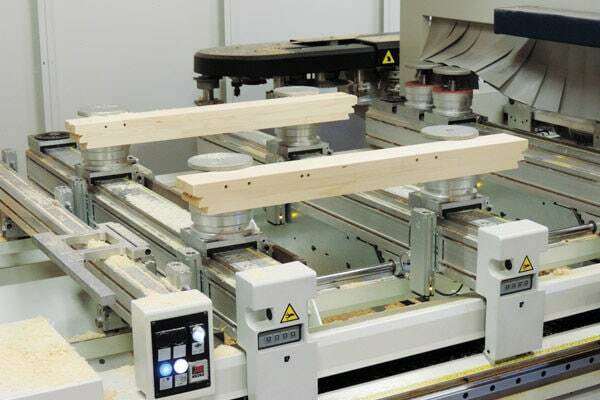 Then, as our turnover increased, we moved onto making windows in 2012, and had them AEV (Air, Wind and Water) certified through a series of tests carried out at the Céribois wood industry resource centre. Currently, approximately 30% of the carpentry shop’s turnover comes from window construction. 60% of this originates from building site installation activities and about 40% from private customers. “The accord 25 fx work centre offers high performance for a minimum investment,” explains Thierry Nicolet, the man who has been managing SCM Group France for several months now. Specifically designed for SMEs, the Accord 25 FX combines high performance with easy-to-use technology for versatile door, window and stair manufacture in solid wood or panels in wood and non-wood. With regard to this particular centre, one benefit is its capacity to produce a wide range of products thanks to the considerable size of its working table and the large number of tools that are always available on the machine. 76 MENUISERIE PETIT - FRANCE “We were looking for a genuinely multi-purpose tool rather than a machine designed for mass production,” comments Mauro Gramolelli. “Thanks to the accord 25 fx, we can produce more, in a more versatile way, which means we can extend our business to the design and construction of stairs, for example. Thanks to DDX software, the entire process is generated upstream, including the hardware and the preparation of the drillholes for the stop plates, which saves precious time during assembly,” he continues. “We wanted to be able to work simultaneously. To be more precise we wanted to be able to produce one element on one side of the machine while preparing a second on the other. Now we can do that, because on the machine’s automated table, each mobile element has its own motor. 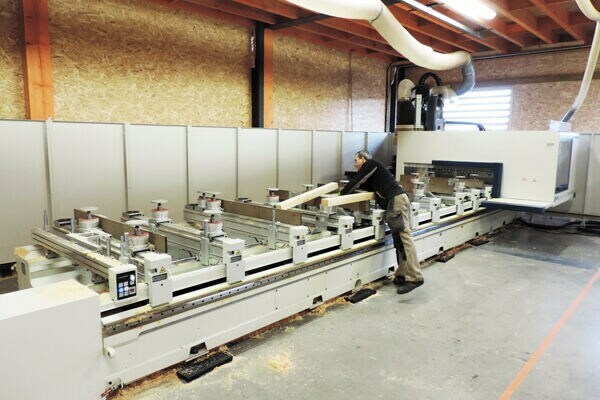 In my opinion, digital commands are essential for the future of the woodworking sector, without forgetting that they also allow us to reduce labour costs significantly.” At the same time as the purchase of the work centre, the carpentry shop is also investing in a range of Leuco brand Record tools (a company Thierry Nicolet used to manage).